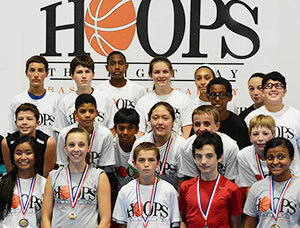 Hoops The Right Way, basketball academy and training for students in Northern Virginia, teaches teens and children to play basketball the right way! If you are looking for excellence in coaching and the opportunity for your teen or child to learn the game of basketball look no further. We teach students how to shoot, dribble, pass and play the game the right way. Hoops The Right Way basketball academy and training camps teach kids and teens how to properly shoot, dribble, pass, defend and play the game of Basketball. Through individual, small group, and team training sessions students have a blast while learning the fundamentals. If you are looking to take your team’s basketball game to the next level, look no further. Our trainer, Coach Ken (AKA Coach K), has over 20 years of professional basketball training experience and is an active player of the game. We offer basketball training sessions year-round. Sessions are 1 hour long and held on various days of the week and weekends. 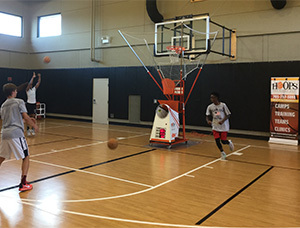 Our specialized ball handling and shooting classes use “The Gun” shooting machine that many professional athletes use. 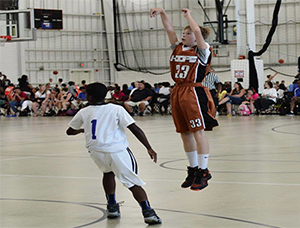 In Northern Virginia Hoops The Right Way basketball academy and training offers one-on-one, small group and team training opportunities for students and their teams through basketball camps and leagues. Teens and children learn to play basketball the right way with Coach K and his professional staff who care about students learning the fundamentals that make the game of basketball great!